The legal foundations of thousands of public-sector bargaining agreements could soon disappear. 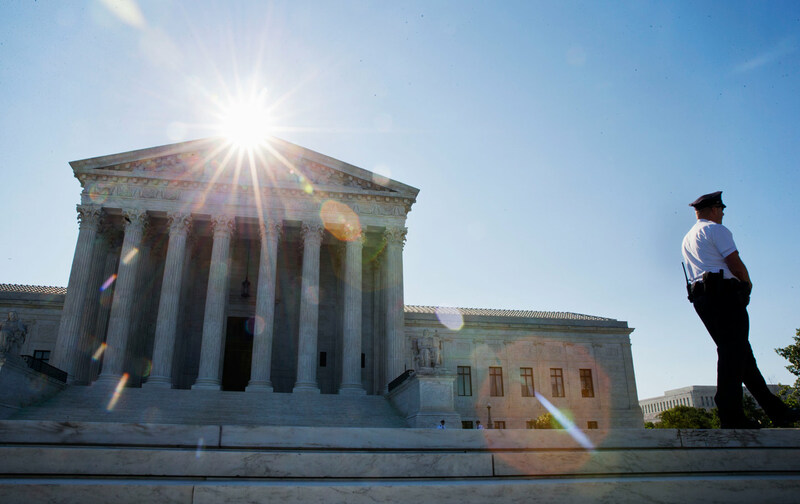 On January 11, the Supreme Court will hear argument on Friedrichs v. California Teachers Association, a full-bore attack on public-sector unions. The lead Friedrichs plaintiffs, a group of fiercely anti-union California public-school teachers, seek to reverse Abood v. Detroit Board of Education (1977) on First Amendment grounds. Abood has provided the bedrock constitutional analysis and recommended administrative structure for public-sector unionism for nearly 40 years. Its reversal would trigger an earthquake in American labor relations. The legal foundations of thousands of public-sector bargaining agreements, covering millions of workers providing all manner of public services, will disappear. The whole of American public employment, at all levels of government, will become a “right to work” (i.e., right not to pay for service) killing field for unions. The Court has revisited Abood six times since its first announcement, most recently in last year’s Harris v. Quinn. Strong majorities on the Court have reaffirmed the ruling—five times unanimously—in all of those cases. Every member of the present Court has either authored or joined in at least one of those reaffirmations. But back in Harris, Justice Samuel Alito effectively invited the current challenge: He spent nearly half of his lead opinion attacking Abood on First Amendment grounds before getting to the Court’s decision that it didn’t cover the state-supported homecare workers at issue there. The right answered this invitation immediately. Friedrichs was thrown together by a variety of business-backed anti-union advocacy groups led by the hard-right Center for Individual Rights. The suit raced through the District Court and the Ninth Circuit Court of Appeals without full evidence or oral argument. (Both courts dismissed it.) With obvious confidence that they would soon be moving up the judicial chain, the Friedrichs lawyers actually asked for this unusual process. And sure enough, despite unanimity among the Circuit Courts against their position, they gained review by the Supreme Court on their first try. There’s an unpleasant, piscine smell to all of this. Two considerations are important to understanding the substance of Friedrichs. The first is that the First Amendment prohibits “compelled” political speech. This means the government cannot make you pay for advocacy you disagree with. The second is that American labor law requires that any union certified as the exclusive bargaining representative of a group of workers must equally represent and service all of those workers—dues-paying union members and non-paying nonmembers alike. This immediately creates a free-rider problem for unions that, left unattended, will kill their capacity. Why pay for something when you can get its services for free? Abood mitigated this free-rider problem for public-sector workers while respecting the constraints that the First Amendment places on their government employer. Noting the public and employer interest in labor stability, the Court found it reasonable for a public-sector union shop to charge nonmembers the equivalent of union dues—called an “agency fee” or “fair-share fee”—for its services. But it restricted the immediately enforceable portion of that fee to union costs in negotiation and administration of the relevant collective-bargaining agreement, and required unions to give nonmembers a convenient way to opt out of paying for all other union activities, which typically include public advocacy. The Friedrichs plaintiffs deplore this reconciliation of First Amendment strictures and the practical requirements of union maintenance. For them, all speech in the public sector—even speech only about the mundane practicalities of collective-bargaining agreements—is political, simply because of where it happens. None of it can be compelled—meaning no payment for union service can be required of anyone. They also assert that the opt-out provision is insufficient to protect workers from supporting speech they disagree with. But the plaintiffs’ argument is almost entirely detached from actual fact. They make no effort to show any harm to them caused by union bargaining or administrative activity, or any actual failure of the opt-out provision to protect nonmember autonomy. For all their outrage, this is very thin gruel. By conventional Court standards of review, it fails. Indeed, it offers literally nothing new to think about at all. So why did the Court even take Friedrichs for review, and what will it do? Nobody really knows. One speculation is that the Court, tired of the endless attacks on Abood and the misinterpretation of its own views, has taken Friedrichs only to put itself on record in dismissing its arguments as jejune and wrong, not to mention cynical and malign. Another is that the Court’s conservative majority agrees with much of what the Friedrichs plaintiffs say, but prefers a more decorous and incremental approach to destroying public-sector unions, perhaps by replacing the current opt-out regime with a more demanding path to nonmember money for their work. A third is that the Court is ready to start the earthquake. That would obviously contradict what it has said before about Abood. But it would be perfectly consistent with the respect for business and the contempt for unions that the Court has shown elsewhere. Reason and precedent, as well as a decent respect for working people, command the first course. The Court should follow it and forcefully reject the Friedrichs appeal.